Preventing the disease before it can develop is the best gift you can offer to your body. While there are countless ways to prevent medical conditions, the easiest and most effective way to begin is through a well-balanced nutritionally adequate diet. Whatever foods or beverages you consume, they can affect the health of your teeth or gums. The more sugary and acidic these foods are, the worse your oral health and wellbeing can be. Certain types of food have been associated with higher levels of bacteria that causes cavity. A poor diet usually involves an insufficient amount of vitamins and minerals. This not only affects you overall health but also increases your risk for tooth decay and gum disease. Though the teeth have the strongest natural material yet discovered, they are not immune to the effects of disease and wear. With poor dental care and unhealthy diet, your teeth are more susceptible to tooth decay, which is responsible for untold pain, discomfort and tooth loss. Fortunately tooth decay is preventable. Find out what foods help prevent tooth decay. If you want to keep your teeth strong and your gums healthy, these are the types of foods you need to include in your diet as these foods are known to protect your smile from dental decay. Cheese – a slice of cheese prevents increase in acidity when consumed after eating sugary foods. Cheese is known to stimulate saliva. With its high calcium content, cheese influences the balance of re-calcifying teeth and protecting them from loss of calcium. Cow milk – lactose, which is found in cow’s milk, produces less acid than other forms of sugars and doesn’t trigger decay as readily. Moreover, cow’s milk also contains phosphorus and casein, which also helps stop decay. On the other hand, bottle-feeding milk at night can lead to tooth decay. Plant foods – these types of foods are fibrous and protect your teeth by stimulating saliva mechanically. If you are fond of eating peanuts, hard cheeses and xylitol chewing gums, then good for you. They also act the same way and help defend your teeth from decay. Black and green tea – polyphenols and flavonoids found in black and green tea are complex antioxidant compounds also found in various plant foods. The fluoride in black tea may also improve prevention towards tooth decay. Chocolate – unrefined cocoa without added sugar content are found to have some anti-decay potential because of its polyphenolic compound, according to some evidence. However, processed chocolates with high sugar content are obviously not good for your teeth. A fibre-rich diet is excellent for your dental health. Research shows that eating a diet filled with natural fibre foods can reduce the odds of tooth loss by around 30%. Eating a diet rich in fibre-full foods such as bananas, apples, sweet potatoes, peanuts, blueberries and green leafy vegetables can reduce the likelihood of tooth loss by 30% and lower the risk of bone loss connected to receding gums by 24%. If you are planning to lose weight while improving your oral health, incorporate fibre into your diet. Fibre dense foods result in a satiated feeling and take more time to chew, making you slow down and eat less your brain will have enough time to process the “full” feeling. Losing weight helps both kids and adults prevent and fight various dental problems. According to scientists at Case Western Reserve University School of Dental Medicine, heavier adults are at greater risk for gum disease than their lighter counterparts. Their hypothesis is that obese individuals accumulate more dental plaque than leaner people. Dental plaque is the main cause of some of the most common dental concerns such as cavities, tooth decay and periodontal disease. Make your diet fibre-rich by eating apples instead of drinking the juice; include cereals topped with slices of bananas, some cherries or raisins. Choose whole grain bread and grab a bowl of hearty vegetable soup with large pieces of vegetables. If you are looking for more tips on how healthy diet can benefit your overall oral health, visit your Toorak dentist at Simply Smiles Dental for the best resource of information. Good eating habits and good dental care habits are both crucial for the general wellbeing of your teeth, gums, and entire body. Simply Smiles Dental always finds the best prevention and treatment strategies for various oral health concerns. 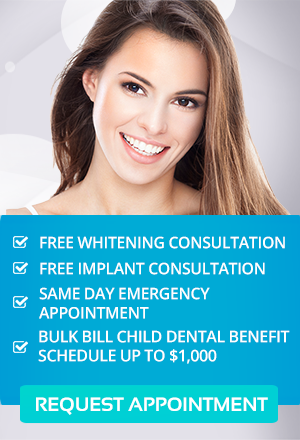 Get a healthy beautiful smile with our comprehensive and first-class dental services. Your just one step away from having the smile you always wanted. Don’t miss our latest dental offers. Contact us on (03) 9826 2220 or request appointment online. Bulk Bill Child Benefit Schedule Up to $1,000.